Whether or not it’s because I’ve left it too long since finishing this I’m not sure, but I’m finding it difficult to get a handle on Untold Stories, at least for the purposes of writing about it. Reading it was a different matter: it delivered the necessary pith, dry wit and calmly observed misery. It had me wondering what the hell Alan Bennett was for, and then wondering how I ever got along without him. He has a knack of seeming as open and honest as an old friend, and as walled up and infuriating. If these large books he produces every ten years (will 2014 see another?) are his golden eggs, there is a strong sense that any attempt to hurry him along would be the equivalent of killing the goose that lays them: they are accumulations more than constructions. In his introduction Bennett compares them to the Beano and Dandy annuals with which he grew up: miscellanies, drawing their charm from their diversity. And so it is that in the same volume we have ‘autobiography, diaries, lectures and occasional writings’ (p. x) which lurch from heightened emotion to everyday observation, from the extremely personal to detached criticism. It is difficult to know how to put it back together again. I wanted to cheer at that. The longest autobiographical piece is ‘Untold Stories’ itself, a deeply affecting (and depressing) account of Bennett’s mother’s mental illness, and later her dementia, intertwined with the stories of his grandfather’s suicide and his aunts’ late marriages and deaths. His mother, living into her nineties, outlives everyone else, and by the end you feel the weight of the decay of generations: nothing and no-one lasts, and there is an unbearable sadness at the deaths of such modest people. His father in this account is a lovely man, a butcher by trade but also a toymaker and violinist, a shy man who hates fuss and has a fantastic word for it: ‘splother’. When his wife is ill and in hospital he never misses a visiting hour, the strain caused by this situation contributing, reckons Bennett, to his death. His parents both aspire to a social life that they don’t really want: they buy sherry and offer it indiscriminately to anyone who crosses the threshold of their house. His mother’s depression is seemingly triggered by a move to a village in which she perceives that, because it is so small, people might notice her, expect things of her. It isn’t their actual attention which bothers her, the mere possibility of it is enough to cause her severe anxiety. Her son’s own shyness seems almost tame by comparison (but of course shyness is tame, that’s the point). The amount of time he spends in his own diaries commenting on and wandering around cathedrals almost seems an attempt to become Welch. The sensitive soul entranced by historical and art objects is something which often leaves me cold (I didn’t finish Welch’s journals when I read them a few years ago), though I’m not sure why. Where I do fall in completely with Bennett is in his essay-length criticism of ‘cheeky chappies’, comedians like Bob Hope who are ‘practitioners and professionals. There’s no mining of their own lives and no undermining of them either.’ (p. 418). Another turn of phrase deserving a cheer – and not a bad description of what Bennett does in Untold Stories, either. It was bad enough that Ingmar Bergman died, but Lee Hazlewood? That’s something else. 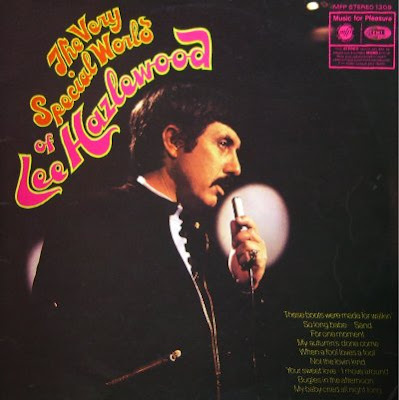 I find after years as a fan I’m still wanting to spell it ‘Hazelwood’, which is a more beautiful word (if it is a word), and every time I have to check. Dig out my Music for Pleasure LP The Very Special World of…, catch the glint in Lee’s eye as he sings into one of those metallic tube microphones that are reserved for schmaltz, read the garish writing above. It’s such a terrific image. I love showing people that LP, especially people I don’t know very well, who are maybe trying to size up my record collection. It would just be so naff were it not for that glint, and really if you didn’t know that Lee was God you’d be forgiven for missing its significance. So on the one hand it’s a kind of inverse snobbery that makes me reach for this record (let’s see if you’re uncool enough to like this), and on the other it’s a genuine love for the man, the moustache, the songs. Which – all three – create and inhabit their own little world, in which all you want is to hear Lee’s tall tales, gentle and sardonic. My first Lee LP was Nancy and Lee Again, bought at a record fair and selected over its predecessor because it looked like it might be harder to find again. It starts with my favourite Lee song, ‘Arkansas Coal (Suite)’, which starts with my favourite chord, the one The Sundays built ‘Here’s Where The Story Ends’ around, and My Bloody Valentine ‘Loomer’. A chord which can’t quite reach itself and ends up chasing its own tail. Add in a wooden whistle (at least, a whistle that suggests woods), Lee’s bedtime story voice (‘Not so long ago just outside Paris, Arkansas, a young woman had a mountain to climb’) and Nancy at her most solemnly charming (‘Gonna climb up that mountain / ’Cause there’s one thing I know / My daddy’s in that mountain / Digging Arkansas coal’), and every duet you ever heard before just dissolves into dust. Lee is the daddy who goes out mining during the day, Nancy the daughter who idolises him. Sometimes she’s the wife too. It’s a bleak story: Lee’s character is wholly absorbed by the mountain he has known from childhood, in which he works, and in which he knows he’ll die. Mining’s hard, it’s not going to leave much energy to do anything else, and it’ll probably kill you before you retire, is the attitude here. What makes the song so lovable is the daughter’s perspective: she stays out past tea-time so she can ‘lay my head on the ground / And listen to the sound of my daddy digging’. It’s an ingenious way of eulogising unromantic hard work. Sentimentality is avoided because the Nancy character loves her father, and love trumps sentiment. A little later on, a cover of Dolly Parton’s ‘Down From Dover’ (which has always made me want to hear more Dolly, though I’ve yet to get around to it) gives us a sadder story still, a man fleeing from a woman he’s left pregnant and the baby, apparently sensing the father’s departure, gives up on life and is stillborn. Nancy does overact a bit on that one, but you get used to it, and Lee was never more menacing. This is the song which provides the spooky strings for The Go! Team’s ‘Ladyflash’, it was great to have him updated like that. He should be as plundered as Isaac Hayes. Perhaps he is and I haven’t noticed. And then, having reached this dramatic low point at the beginning of side two, Nancy and Lee Again forgets that it ever wanted to be mysterious or melancholy, and wends the rest of its way merrily through subjects like grandchildren (‘Tippy Toes’), infidelity (but not really, and in a fun way – ‘Did You Ever?’) and What It’s Like To Be The Oldest Teenyboppers In The World (‘Got It Together Again’). The latter providing the hilarious line later recycled in The Jesus And Mary Chain’s ‘Here Comes Alice’, ‘I’ve been good and I’ve been mean / And I’ve been looking for a Coke machine’. Everyone loves Lee. It’s sad that he’s gone.